The yellow spider lily has many aliases; they are Spider Lily, Naked Lily, and Golden Spider Lily. 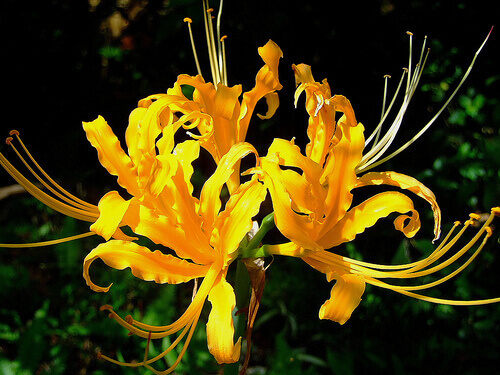 The scientific name of a yellow spider lily is Lycoris Aurea. It cannot reproduce sexually. The plant has both sexes and when they produce they just randomly assort their chromosomes so that there is no order to the assignment to each plant. Since there is no order in the chromosomes assortment that means the plant is sterile. The only way for the plant to reproduce is by bulb division. 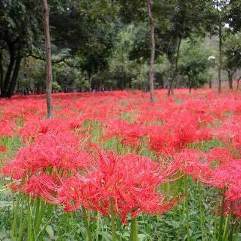 When planting the red spider lily you must plant the bulbs 2 cm deep into the soil, with 15-30 cm between each bulb. They should be planted in the spring. The yellow spider lily should be planted in a full-sun environment. It will bloom in late summer and be around 60-70 cm tall. The leaves remain green all winter long and at the first hint of warm weather the following spring, they will die. The Lycoris Aurea is a perennial plant.